Product #5755 | SKU C12VR | 0.0 (no ratings yet) Thanks for your rating! 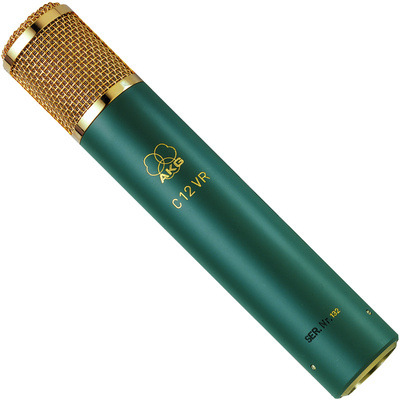 Recreates the Legendary C 12 Tube Microphone! The capsule is a rerun of the original 1950s CK 12 design using the latest manufacturing techniques. The result is a sound with the same characteristics of warmth, clarity, and presence. A remotely controlled preattenuation pad can decrease the output level (sensitivity) of the microphone by 10 dB or 20 dB. The original 6072A vacuum tube, selected for low noise, is the very "heart" of the microphone. The 1-inch dual-diaphragm capsule permits the selection of nine different polar patterns so the C 12 VR provides excellent sound in many different applications. The diaphragm is manufactured from a special gold-sputtered plastic foil. P.c. switches allow you to increase the nominal sensitivity of the microphone by 10 dB. The large core section of the output transformer keeps low-frequency distortion at a minimum. A special shock mount protects the delicate vacuum tube from rough handling.